I have been waiting for just the right time to bake these cupcakes...and today was the day. This project started when a client contacted me regarding vanilla birthday cupcakes in turquoise and/or lavender. A vanilla cake is the ideal launch pad for anything sporting something called Bahama Blue with shimmery sprinkles. The special request also included mini-cupcakes. After baking two dozen, I remembered why I don't typically offer this choice...twice the work for half the cupcake! But, in the spirit of baking in the test kitchen to see if mini-cupcakes would be the right choice, I soldiered forth. This cupcake stand is a Fiesta Ware Sweets Comport. Once the baking was done and the decorating started, I really loved the results. This won't be something that I routinely bake or offer, but I'm happy to bake these little cakes on special request. I especially love the colors; the three types of shimmery pearls and glitter allows the client to custom design a cupcake for a sweet birthday treat. I tested all three types of shimmery goodness: blue pearls, blue sugar glitter, and purple sugar glitter. The tone on tone looks lovely and using a contrasting color works too. I do love the pearls. Here's the thing... the test cupcakes only took about half the batter, leaving plenty of standard-sized cupcakes to decorate. 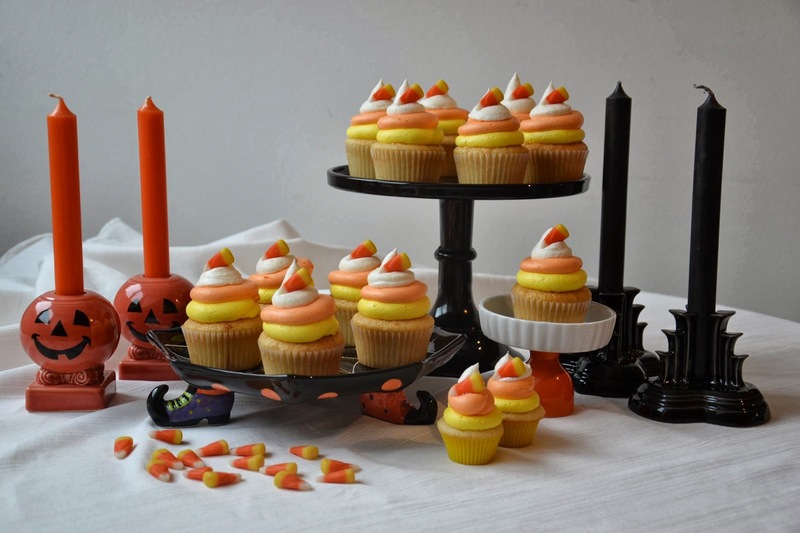 And October is a perfect time to explore a Candy Corn Cupcake. I've seen this style of cupcake on Pinterest, so I knew it was doable. Using the Wilton 1A tip, I piped a circle of Vanilla Buttercream tinted yellow (Wilton gel, Lemon Yellow) as the base of the design. Then I added a swirl of orange (Wilton gel, Orange). And finally a bit of white on top. The technique I used for the top was not a swirling movement, but something similar to filling an ice cream cone - using pressure to fill the top and then pulling the icing away. Normally I wouldn't add the candy corn, but I thought it would help our German friends make the connection of the candy inspiration to the cupcake. The swirls aren't perfect and in places there is unevenness, but that's ok. It's a first attempt and I love'm. I also completed a couple Candy Corn mini-cupcakes just to see what that would be like. Oh, they were darling. I'm grateful to my life partner and his support. I'm grateful that I can laugh at myself and my cupcakes...while eating a handful of candy corn.